The Sport Gard is designed for those who need to feel secure while involved in sports such as soccer, golf, horseback riding and others. 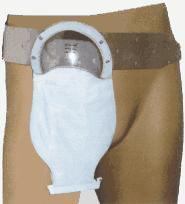 It is made with the same materials as the Hernia Gard and also has a slip buckle. The Sport Gard sizes are the same as the Shower Gard and the Hernia Gard. The central area of this product is a unit consisting of three laminated Stoma Gards. This unit is extremely strong and provides the security required for active sports.